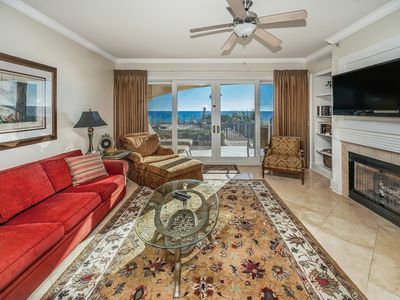 Located directly across the 30A from the public beach, Playa Bonita 30A Gulf Place is a stunning, European style, one-bedroom, one-bath beach condo. Accommodating up to 4 vacationers comfortably, it is perfect place to escape reality, celebrate a special day, or enjoy the company of that special someone. 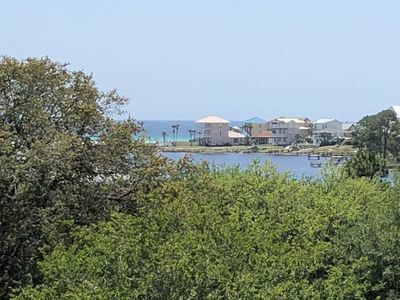 The large balcony is perfect for enjoying the breathtaking views of the sugar white sands of the Emerald Coast or just relaxing with a good book. 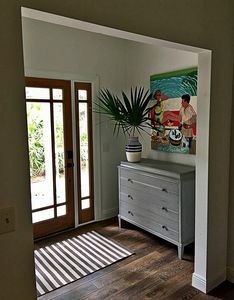 Playa Bonita 30A Gulf Place updates include: new beach hardwood flooring, shiplap interior, expansive Quartz countertops with barstools, a counter depth fridge, microwave with grilling element, Keurig coffee maker, and the necessities to prepare a romantic meal. 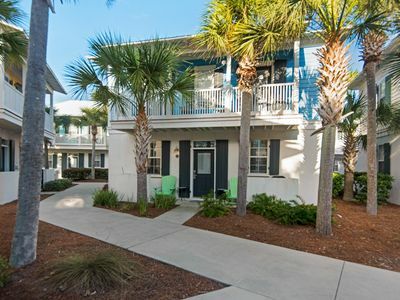 Along with complimentary highspeed WiFi, your beach retreat also includes: an extra cushy white queen sleeper sofa, a large smart flat HDTV and a Blu-ray DVD player in the main living area. The bedroom includes an extra comfortable queen size bed and a smart flat HDTV. The bathroom has a large bath tub, standalone shower, and a vanity perfect for getting ready for a night on the town. A new washer and dryer is located a few steps away on the 4th floor. 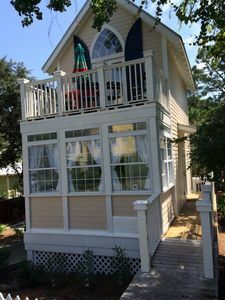 Playa Bonita 30A Gulf Place has 2 beach chairs and 4 beach towels available for you to borrow during your stay. 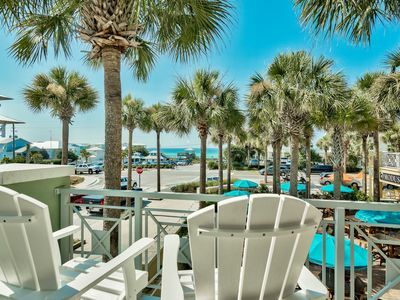 For additional beach gear, Jongle Beach Sports and Recreation offers Playa Bonita 30A Gulf Place vacationers a 10% discount on beach chair setups, bike rentals, and water recreation equipment. Jongle Beach will also coordinate a family bonfire creating a lifetime of memories. 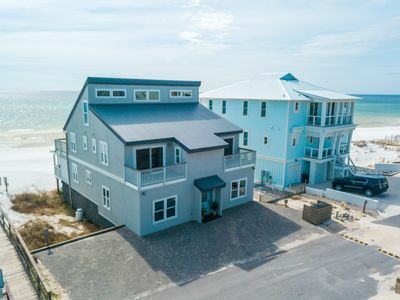 Playa Bonita 30A Gulf Place is located within Santa Rosa Beach, and surrounded by all that 30A has to offer, including favorites: Eden Gardens State Park, Grayton Beach, Seaside and Watercolor Beach. Enjoy the local events and festivals occurring in the area throughout the year, venture over to the Topsail Hill Preserve State Park for hiking and nature trails, or simply explore the local cuisine. For eclectic shopping experiences, Gulf Place features its own array of local shops and boutiques, restaurants, and entertainment. The area is also home to many championship golf courses. The weekly community events calendar includes: The 3rd Thursday of the month “Wine Walkabout”; every Thursday night from 7PM to 10PM, La Playa Restaurant hosts The Forrest Williams Band - one of the best local 30A bands - for a night of live music and dancing. Enjoy the music and dance the night away on your balcony - Playa Bonita 30A Gulf Place is immediately above La Playa Restaurant. 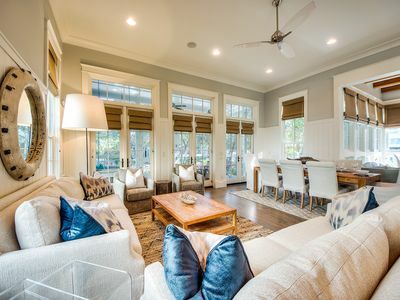 The Gulf Place neighborhood has stunning palm tree-lined streets, wide sidewalks, outdoor patios with large umbrellas, nature walking trails, abundant green spaces and plenty of park benches to sit and enjoy the views. Play a friendly tennis match with friends or family on one of the two courts, cool off in one of the three swimming pools, or appreciate a performance at the amphitheater. When it is time for a break from the beach, there is plenty to do in the area. 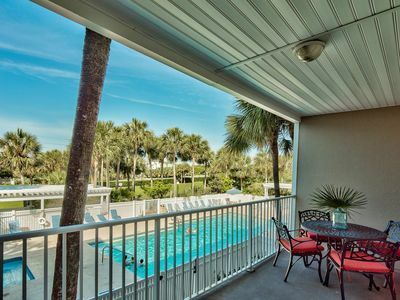 Gulf Place has 3 community pools (two of which are heated), a hot tub, shuffle board and tennis courts for you to enjoy while vacationing. Within walking distance is an outdoor amphitheater and a large area where the kids can play and throw a Frisbee. In the summer, you can also enjoy a concert on Sunday nights. There are also several local shops and artist booths to browse at your leisure. Within the quaint shopping area you will also find a surf shop, pharmacy and spa. If you are looking for a place to eat, you will have several delicious places to choose from within walking distance. If you would rather stay in to eat, it is a short drive to a Publix grocery store or Walmart. You can also rent bicycles and other outdoor water equipment nearby. There is a nice, mostly flat, 18.6 mile scenic bike path that runs along 30-A. Bike rides along the path are a great way to explore the neighboring areas. 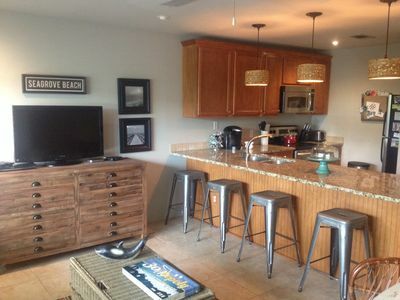 Playa Bonita 30A Gulf Place is less than 2 miles to Santa Rosa Golf & Beach Club. It's also a 20-Minute Drive to Silver Sands Outlet Mall or 15 minutes to Grand Blvd's many shopping and dining options, including a Grand movie theater. The stunning sand on the beaches of South Walton is some of the purest and whitest in the world. Our sand is actually small Quartz crystals that are practically clear. The nearby Appalachian Mountains are formed primarily by Quartz rocks, and after the last ice age over 20,000 years ago, the Earth's temperatures began rising and the ice caps started melting. The Apalachicola River formed and started carrying this new water to the Gulf of Mexico, and still does to this day. As the sea level began to rise, these Quartz sands formed a new shoreline. These beautiful white sands continually replenish giving us year-round jaw dropping beaches to enjoy. The famous emerald color of the water is due to the luminescence of the sparkling Quartz crystals. Our Gulf waters stay so clear due to the Choctawhatchee Bay that helps to filter the water from nearby rivers and streams before it reaches the Gulf. 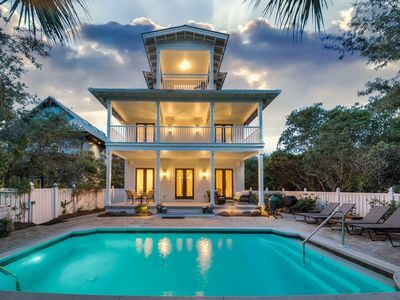 Now that you know, book your Playa Bonita 30A Gulf Place escape now, and enjoy this truly rare and gorgeous place! 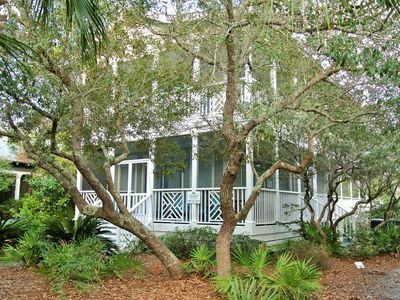 Paradise30A~ DeckedOut, Updated Kitchen, 2 Community Pools, 2 Bikes Included! 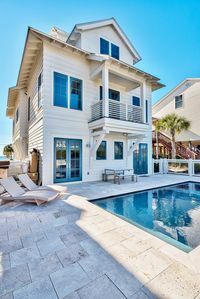 Gorgeous NEW gulfview home in Seagrove Beach! Sleeps 16+ people. Steps to beach. 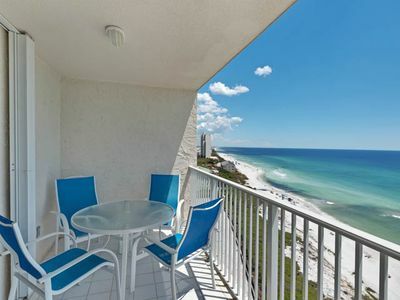 Summer Breeze: Amazing Gulf Views! Large Private Pool! Steps from the Sand! Lakefront! 2 Kayaks Provided to Fish or Paddle! Gourmet Kitchen! 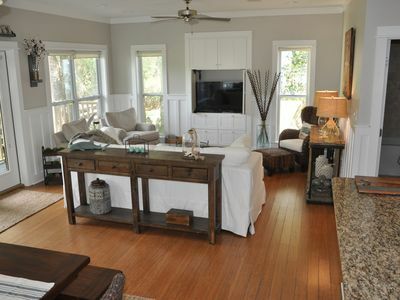 "High Tides & Good Vibes"- Breathtaking 4 Bedroom Home With All New Furnishings! Casa Bella: Newly Renovated, Beach Front Home! 8 BR / 5.5 BA! 3 night minimum in high season! 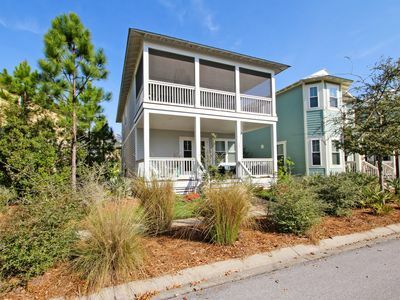 Dune Nothin, Beach Haven at Dune Allen Beach 4BR/3BA, 2 minute walk to beach! 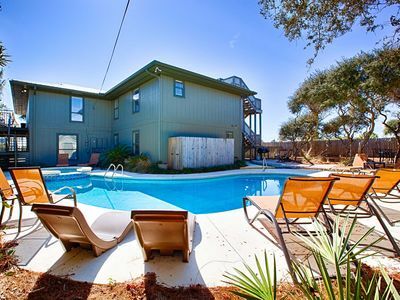 Palms of Dune Allen 206 - Gulf Front, Community Pool, Open Thanksgiving Week! 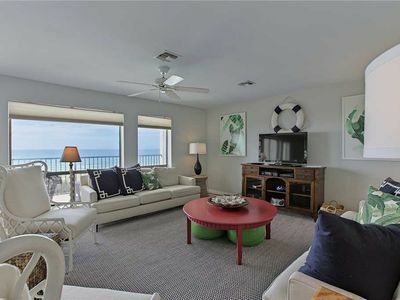 Adagio B-104: Beach-front 4 bedroom - Steps from the beach walkover!!! Book for Mother's Day! 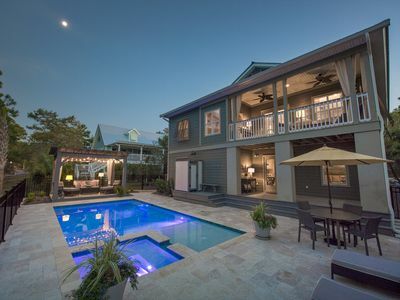 30A Home w/ Private Pool & Putting Green! 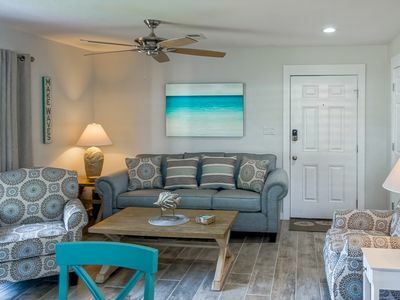 Bungalows at Seagrove 153 - Ready, set, book for spring!